Yangon, Myanmar – (ACN Newswire) – Yangon International Airport (YIA) yesterday hosted a reception in appreciation for its airline partners, while looking forward to updated terminal facilities and enhanced carrier partnerships to handle the increases in passenger numbers expected following Myanmar’s relaxation of entry visa requirements last October. 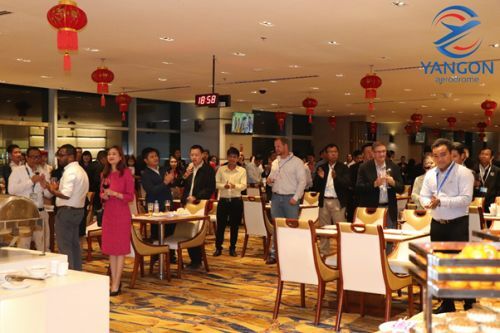 The reception was held at Mingalar Sky Lounge Terminal 3, and graced by the Department of Civil Aviation’s Director-General U Min Lwin and Deputy Director U Ye Htut Aung, YIA’s airline partners, business partners, and the YIA team. Yangon Aerodrome Company Limited (YACL), operator of YIA, expressed gratitude for the partners’ continuing support and help in growing tourism and civil aviation in Myanmar. Following the government’s efforts to ease visa regulations last year, the number of Asian travelers to Myanmar has increased significantly, with China contributing the majority of visitors, while 32 international airlines and 30 international destinations are operating at YIA, an increase of two airlines and five destinations in the last year. According to the Ministry of Hotels and Tourism, 3.2 million international visitors, 38% of which came from China, arrived in Myanmar between January and November 2018, an increase of around 2% compared to the previous year. 945,000 Asian passengers arrived during the same period, with China contributing 260,000 of these visitors. Mr. Ho Chee Tong, Chief Executive Officer of YACL, said, “We look forward to further cooperation with members of the aviation industry, and a better 2019. We are working continuously to improve YIA’s facilities and operations, and are marketing aggressively to add fight routes in preparation for the increase in passenger demand. We are ready to work with the government and our valued airline partners to boost growth,” he added. Incorporated on 3rd October 2015, Yangon Aerodrome Company Limited (YACL) operates and manages Yangon International Airport (YIA), the gateway to Myanmar. As the company responsible for Myanmar’s largest and busiest airport, YACL sets the standard for YIA as a high-performing aviation hub, built on a foundation of daily excellence in infrastructure, operations and management. Strategically located between India and China, Myanmar is less than six hours by air from two-thirds of the world’s population. With Myanmar gaining popularity as a travel destination, YACL is committed to scaling up YIA’s handling capacity for visitor traffic while continuously providing a quality experience for passengers and airlines alike. Learn more at www.yangonairport.aero.